Title : Ultimate Explorer Guide: Explore, Discover, and Create Your Own Adventures with Real National Geographic Explorers as Your Guides! National Geographic has inspired generations of explorers. Now it's your turn! 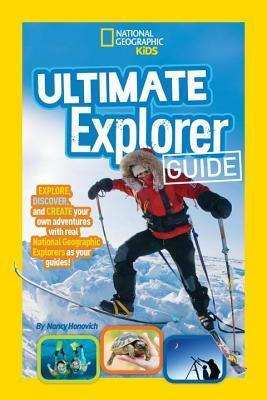 Learn what it takes to be a real-life explorer in this fun and action-packed guide to discovering the world around us. Unearth ancient mummies and lost treasures, encounter wild animals and learn how to protect their habitats, and shoot for the stars with the latest technologies in space travel.National Geographic has inspired generations of explorers. Now it's your turn! Learn what it takes to be a real-life explorer in this fun and action-packed guide to discovering the world around us. Unearth ancient mummies and lost treasures, encounter wild animals and learn how to protect their habitats, and shoot for the stars with the latest technologies in space travel. Amazing stories, fantastic photos, and hands-on-activities inspire curious kids to start discovering on land, air, and sea. Profiles feature National Geographic explorers of all kinds: paleontologists, biologists, photographers, artists, writers, activists, conservationists, and more. Kids are inspired to follow their passions into careers and introduced to the first steps to take to achieve their dream.